Our directory of 76 vaporetto and airport-boat stations has aerial images, route numbers, and more. 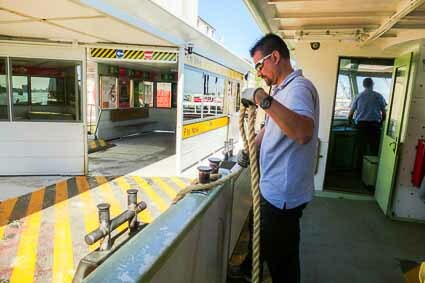 ABOVE: A sailor on an ACTV public water bus handles mooring lines at the Fondamente Nove station. This directory has pages for 76 ACTV and Alilaguna waterbus stations in Venice and the Venetian Lagoon. On each page, you'll find a satellite map, one or more photos, and other station details. Waterbus stations come in a variety of shapes and sizes, from small single-platform stations without ticket machines to large stations with ticket counters, turnstiles, waiting rooms, and vending machines that sell tickets and Tourist Travel Cards. See Types of Venice Waterbus Stations for examples of the two basic categories. If you don't have a valid ticket or tourist travel card before boarding an ACTV water bus and are unable to obtain one at the station, read these instructions to avoid embarrassment and a large fine. In stations with multiple platforms or pontili, the ticket booth or ticket machine (if available) is often located at only one of the platforms. We've omitted a few out-of-the-way commuter stops (such as Caroman, south of Pellestrina) that are of little interest to visitors and aren't included on ACTV's official route map. For more information about Venice public transportation (including routes, fares, and tourist passes), go to the "Related articles" menu at the bottom of this page or view our Venice transportation index.